Let’s talk about disappointment. Let’s talk about David Accam. Accam’s stint in Major League Soccer began in 2015, when he joined Chicago Fire from Swedish club Helsingborg. It was the same year he was making an impact for the Ghanian national team, scoring in Africa Cup of Nations qualifying. His quality translated smoothly to MLS, as he bagged 10 goals in 24 appearances in his first season. By the time Philadelphia Union signed him as a designated player in January, it seemed like a brilliant pull. His 14 goals in 2017 were good for 11th in the league and most importantly, he had scored consistently — 33 goals in three seasons is high quality at just about any level. At a time when Philly was starving for a signing, Accam wasn’t just any old player. Finally, the Union splashed the cash for a star. Finally, C.J. Sapong would have support on the wing. Finally, the next step. For those reasons and more, perhaps expectations were too high. Even one look at Accam’s final stat tally is maddening — 23 appearances, one goal. The Union swapped 1.2 million in allocation money for one goal. Seriously? It would be far worse if that one goal wasn’t a stoppage time winner against his old club. The first thought is that goal could have come from anywhere. In 23 chances, surely anyone that was on the bench could have scored that goal. It could have come from a Bethlehem Steel player at practically no cost. It’s very ugly on paper, but if you watched the matches, it wasn’t at all surprising. For the longest time, Accam just didn’t appear to work in Jim Curtin’s setup. Left side, right side, it didn’t matter. He was often invisible, to the point where a 2/10 match rating was deemed generous. After a long list of starts proved unproductive, he was relegated to the bench and failed almost every time to provide a spark with fresh legs. The 95th minute winner in Chicago would have made for a good (albeit late) turning point in the middle of July, but that turn never came. Weeks went by and the Accam disappointment kept mounting. This review, and the general outlook of Union supporters, would probably be much harsher if not for Accam’s season-ending surgery last month. In some ways it was a fitting end to a miserable season, but there are a few important factors that go along with it. First, it was the second time he went under the knife. He had an initial sports hernia operation last November before signing with the club, and, at that time, it clearly wasn’t an issue for him. He expected a full recovery. Fast forward almost 12 months, though, and Accam, not the Union medical staff, opted for surgery. You give him credit for being honest and not trying to push it further, but you also wonder just how long it’s been an issue and if he withheld anything this year. Even more important, the club knew about the injury and knew about the operation. Earnie Stewart and Jim Curtin knew before Accam was signed. It’s easy to say that none of them could have possibly known about the lingering affects of the injury — maybe not. But as previously stated, this wasn’t some bench fill-in or an academy player. This was a million-dollar superstar that was supposed to change the club. If he’s that much better than other MLS players getting paid fractions, maybe the research should be that much more meticulous. You don’t have that kind of money to drop very often, so you better make damn sure he’s the guy and he’s going to be healthy. Especially because this has happened before. Longtime Union supporters will remember the name Bakary Soumare. In a case very similar to Accam, Soumare was a high-profile defender signed from overseas that had lingering knee issues. The club knew about the injury and eagerly signed him in the transfer window. What happened next was a huge snowball — a knee operation led to a follow-up, missed time and declining fitness led to a benching, and frustration over not starting led to a trade request. 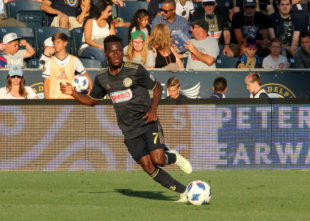 This was a former MLS All-Star that played in Europe and marked a huge addition for the Union, but he made just four appearances for the club. Injury, miscommunication, and/or mismanagement unraveled it all. Now, there are obvious differences between Accam and Soumare. For one, Accam as a forward will always be more scrutinized, but Soumare remains something to learn from. It’s the type of situation that shouldn’t happen twice at the professional level. A guy that was once on trial at a Premier League club should never post a season with a single goal — either the injury is taken care of from the onset or he simply produces like he should. All of this also begs the question: What exactly did Chicago know? One sure-fire reason to trade arguably your best attacking player is a lingering injury. Maybe there were other circumstances or maybe they just wanted to take the money and move on, but it makes you wonder. When one of the best players in the league follows three great years with a dud, it’s perfectly reasonable to look back at where he came from for a second. Unlike Soumare, is it possible that Accam comes back in 2019 and produces for Philly? Well, theoretically, sure. It won’t be about his ability — we already know what he’s capable of in this league. Instead, it will be about being healthy (like, actually healthy) and the system he’s in. Will Curtin still be around sending out the possession-based 4-2-3-1 or will things change? You’ve got to think Accam will get a second chance because he’s designated player, after all. Everyone in the organization will be hoping this story ends differently than the last one. Best case scenario would be something similar to Chris Pontius who went from injury bust with DC to a comeback year for his first season with the Union. I think I can respect the U for at least taking a gamble on Accam. If he’d played to form, the front office would have looked good. While I agree with the premise, knee injuries and hernias are completely different injuries in terms of long term health. The first game Accam with consistently beating Farrell on the dribble, which is no easy task, and looked like he was worth every penny. After that he was terrible and in hindsight injured. For a speed/agility guys there’s not much worse than a hernia injury that you can actually play though. The good thing though is that there really isn’t much risk that he will have any lingering problems from this new surgery, which can’t be said about knee issues. Granted this is was without a doubt a massive disappointment. For what it’s worth, Accam was in NYC for the Union’s season-ending loss to City. In street clothes, traveling alone, on his own dime (presumably)… I don’t know exactly what that means, but I’d like to think it means something. I’m putting it down as a player trying to impress his new club and play through an injury. After watching more than a few Flyers try and play through sports hernias, it becomes obvious the player is not at full strength. They seem to lose the quick burst ability, though are still generally able to keep up otherwise. Accam seemed to act a bit like that. He genuinely seemed to want to be here and work hard for the club. I just hope he’s healthy enough to get the chance next year. Next year, he will hopefully be healthy and will have reduced pressure/expectations. It might help him find his form. I’m willing to give him a second chance. At this point I would say cut Accam loose. Fafa is on the rise and doesn’t look nearly as good on the right as he does on the left. Accam is the same in that he really needs to be on the left. It seems like spending the extra $1mil for potentially 4 more goals (Accam’s career best in 2017) doesn’t make sense. We could absolutely use those $$ on the right side or up top instead. And I really liked the acquisition of Accam when it was first announced last offseason. Who do you play on the wing opposite Picault then? Sapong never scored double digits in his career then had 16 in 2017. Accam averaged 11G and 5A per season with the Fire before having only 1G and 0A this season. He gets this year and the chance to play healthy, before I call it a bust. Having a healthy Accam, that can even score 7-8 goals on the season would be a welcomed addition to the wings. I’ll reserve judgement for now.